Page 9 - KaBOOM! News | KaBOOM! 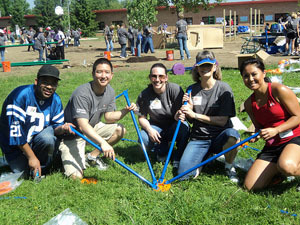 On May 20th, KaBOOM!, Meredith Nicholson Indiana Public School 96, Clarian Health and IU Health built a great new place to play in Indianapolis. In the first week the kids were able to use the playground there were zero discipline issues- which was unheard of! The children are incredibly active. They love the playground and are playing non-stop. 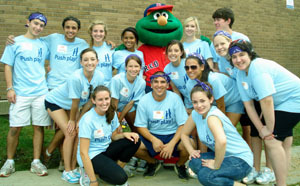 Some local high school students came to help from different schools. One of the students had gone through IPS 96 and he kept talking about how much he wished he had that playground when he was younger. The high schoolers feel great ownership over the project, and are excited to bring their younger siblings to the park. In addition, people that were helping the school for the first time at the build are looking to continue to volunteer at IPS 96. Play it forward with a donation today so we can keep making a difference in communities like Indianapolis. 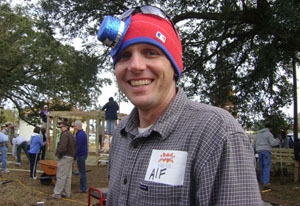 "We are still adding equipment to the park as we remodel our larger park. 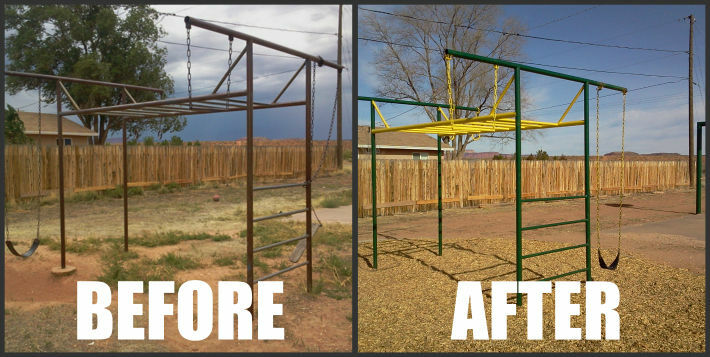 The timing turned out really well, our local LDS ward was looking for a service project, so they helped paint the jungle gym, remove weeds from the basketball court, paint the court’s stripes and the basketball standards. We purchased curbing and engineered wood chips from local sources to make the playground safer. We replaced the backboards and rims. We moved a climber from our other park and are in the process of bringing over a slide and a 4-seat bouncer. We are rehabilitating the pieces now before we reinstall them. That will double the amount of equipment in the park. We are also planning to add benches and tables and there is a movement to add a sand volleyball court. We are looking into the design and costs now. The only thing left that we really want to do is replace the jungle gym with a new small play structure. We are still raising funds for our large park community build so it’s going have to wait for a while. But we are excited about breathing new life into this park and we again want to say thank you for your assistance. We are proud to say it’s not the scariest park anymore." 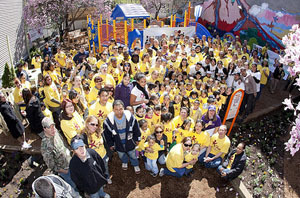 Thank you Fredonia for taking the initiative to fix up your playground! We hope the kids – and adults – enjoy it for years to come. The article “Societal Values and Policies May Curtail Preschool Children’s Physical Activity in Child Care Centers,” and associated study published yesterday by the American Academy of Pediatrics, shows what we at KaBOOM! have seen happening increasingly over the years: the risk of lawsuits and increased academic competitiveness is harming our children. In our aggressively litigious culture, we have become so obsessed with controlling risk that children are missing out on opportunities to grow and learn. There is a difference between an injury and an accident. An injury happens when equipment is in disrepair. An accident is just a natural part of growing up. Instead of accepting that a few bumps, bruises and even stitches are an inevitable part of childhood – and can actually be a healthy learning experience – we have somehow come to believe that accidents of any kind should be avoided at all costs. Play is also under attack in our nation's schools. Shrinking recess and increased homework leave little time for play. And increasingly, cities are building new schools without playgrounds. Despite countless studies proving that play is integral to children's learning and health, most kids aren't getting enough space and time to play during the school day. The intentions are good. We all want our kids to be safe and to have all of the opportunities available to them. Unfortunately, common sense is victim to these pressures. The key now is to take the results of this and other studies and pivot the conversation away from blame and toward a solution. We need to create play spaces for our kids that encourage risk-taking and autonomy, allow them to be in control, and give them the time and space they need to exercise their bodies and master certain skills. That is one reason why KaBOOM! has embraced the concept of the Imagination Playground™ which uses loose parts and encourages creativity. But even the most engaging play spaces won’t help our kids if we don’t shift our societal values to recognize the importance of play in our children’s physical, emotional and cognitive health and development. Once that happens we will automatically start to allocate appropriate financial resources for play spaces and give our kids the time they need to be kids. When I was a growing up I had plenty of opportunities to play, (and yes, I had plenty of accidents, some of which required stitches) as did most of my peers. It took a generation for play to take a back seat and it will likely take a generation or more to correct itself. We must continue to study the issue, but more importantly, be willing to act when the facts can no longer be denied.